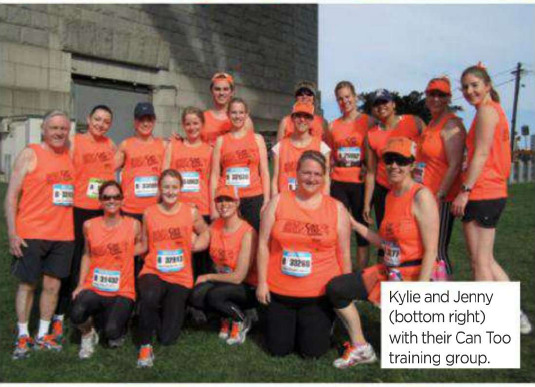 Kylie Field, 41, hadn't run even 100 metres in a decade when she met Can Too running leader Jenny Biggin. But their training program has led to a deep friendship and a commitment to keep raising money for research into cancer. Jenny, 45, became a Team Captain, leading one of Can Too's pods and has also been a mentor for a group training for a half marathon. She has completed six Can Too training programs and raised $6,500. Kylie has completed two programs and raised $2,000. I had never dreamed of running 10km. I just didn't think I could do it but after two difficult pregnancies I decided I wanted to get fit and healthy. Once my boys were three and five I went in the Blackmores 10km run. I had spent time bringing up a young family and I needed to do something for myself. I had no fitness at all before I started training. I thought I would never be fit again and the Blackmores run in 2009 nearly killed me. I walked and ran it in 66 minutes. It gave me the bug. I knew of people who had got fit through Can Too and I saw that they were no different to me so I figured, if they could do it, so could I. I decided to do something for myself and enrolled in Can Too to learn to run properly. My husband, Phill, is into cycling and now it was my turn. The good thing about Can Too is that it is a regular twice a week commitment and that is in our diaries. I was called Stomp because when I started learning to run I used to run very heavily. But the next year I did the same Blackmores run in 54 minutes. That felt really great. I started running because I wanted to keep my fitness up and my weight off. I still do - they are my two goals. I like running because it's so effortless. You don't need any equipment apart from good running shoes, and you can do it anywhere. Plus it's free. The first time I saw Kylie I remember she turned up and she was looking very timid. She looked daunted as we gathered to start our first workout. That first run showed me what a strong person she is. One good thing about Can Too is you don't run distances at first but times which can make it easier for slower runners. For example in our first training session everyone ran out for 20 minutes and then turned around and came back. Kylie found it challenging a lot of the time. Her weight made running a lot more challenging. Sometimes we ran together and I kept reassuring her I would be there. Now she is a fitness machine. We have developed a bond as we were both mums. Kylie's child was a lot younger than mine so it was a lot more challenging for her - some days she turned up without much sleep the night before. But she is one determined lady. We ended up doing the swim program together which was terrific although it was pretty confronting at times with bad weather and big waves. It was daunting at first because I am from Melbourne so swimming in open surf really scared me. Now I get out in the surf with boogie boards with my children at weekends - my husband and friends can't believe it. I told Kylie, I'm going to swim alongside you so that when we both look up from our stroke we will see each other. That trust really helped both of us. I have a family relative who was diagnosed with lung cancer at 42 and died within 18 months, leaving teenage children. She had never smoked or lived with anyone who smoked. No one could understand where it came from and the doctors couldn't put it down to anything. It was so sad and scary to think that it could easily have been me - or anyone I know. Giving something back by raising money for cancer is a terrific feeling. It's a positive environment, too, at Can Too. Everyone is supportive no matter what shape or size or fitness level you are. It has changed my life. My fitness is so much better. I can run to the train without any worries. The biggest change has been emotionally - it does give me a sense of self and time alone which is hard when you work and are a parent. It's also terrific for stress relief. Seriously, I never thought it could happen but you get to a point when you forget you are running. I told another girl in our Can Too group that one day and she didn't believe me. However, she proudly told me the other day that it happened to her. I was the girl at school who used to bring in a note to get out of PE. Eventually I was diagnosed with polycystic ovarian syndrome and insulin resistance. It makes you tired and lazy and, so, I have always been overweight. I had convinced myself I wasn't designed physically to run. But after the birth of my first baby I wanted to set myself a challenge - to lose weight and get fit. I had also just turned 40 and thought it was the perfect time to start. I knew about Can Too because my husband had completed a half marathon the year before with them and he hadn't run in 20 years but did it in under two hours. The first training day I arrived with a head cold and they wouldn't let me run. I had to walk and we covered 20 minutes out and 20 minutes back. Can Too doesn't measure things in kilometres which was great for me because it meant I wouldn't be holding people up. The next week I walked and ran for 25 minutes out and 25 minutes back. By week six it was 30 or 40 minutes each way. I was still walking part of it, but the difference in my fitness was overwhelming. I was the slowest, the fattest and one of the oldest but I felt on top of the world. The key message my husband Mike had for me is that if you can run 1km you can run 9km. The thing with Can Too is that just as you are struggling there's always someone who runs up past you or swims up to you. With running you have to learn to start slow, find your own pace, keep your arms relaxed but use them to pull you up a hill. The gift from Can Too is teaching the technique but also the ability to believe that you can do anything. Two weeks before the race they said we will do the first 5km of the race and run back. I ran non-stop. My legs were shaking, I felt like jelly but I kept going. As I came back across the harbour bridge the coach ran up to me and said I've come to run in with you. I thought, this is incredible and as we came off the bridge I was bawling my eyes out, everyone from my group was clapping me in. It was incredible, 9km in one hour and 27 minutes. It doesn't sound like much but for me it was incredible. I think the running gives you a sense of clarity about your life. The stuff that you would normally blow up as a big thing and really dramatise, becomes nothing after a run. It is a great stress reliever and it does wonders for your mental state. The way it makes you feel for the first time in my life it made me realise I can do anything. I signed up for the swimming program and learned to swim 1km in the ocean. It was the scariest thing I have ever done in my life. They say it's like running 6km but there are a lot of emotional hurdles to overcome as well. After the program I kept running three or four kilometres three times a week. I signed up to do a half marathon but in a happy accident I conceived a child at 41. My doctor said I would never have had a second child unless I had got fit. I found out I was pregnant two days before the swimming race. Once I have the baby I am going to get straight back into it. 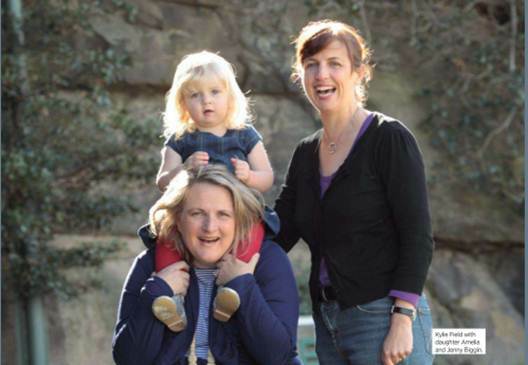 Can Too has raised more than $9 million for cancer research since it was launched in 2005 by Sydneysider Anne Crawford. Anne's father died of cancer at age 51 and she decided to combine her passion for running and fitness to do something to make a difference in the world. 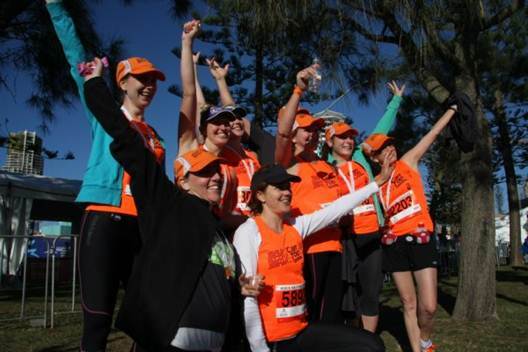 Can Too is supported by the Macquarie Group Foundation and Cure Cancer Australia. Volunteer trainers and mentors help people learn how to be fit. You can either sign up to train for a marathon, a half marathon or a 10km run or to swim 1-2.5km. All you need to do is raise between $800 and $2000 as a donation for the training program.